In Bolivia, renationalisation of the hydrocarbon industry has been a huge economic success. President Evo Morales came to power in Bolivia in 2006 amid widespread discontent. The country had been experiencing a long-term economic growth failure, with income per capita in 2005 lower than it was 27 years prior, and privatization efforts had been widely unpopular, including with the indigenous majority. Conflicts over natural resources, most notably the water and gas wars of 2000 and 2003, respectively, led to the resignations of Presidents Gonzalo Sánchez de Lozada in 2003 and Carlos Mesa in 2005. The Morales administration marked a dramatic turn-around for the country. The economy began to grow, experiencing its fastest growth in decades. Bolivia increased its sovereignty over economic policy; social spending increased by 45 percent from 2005-2012 and poverty was reduced by 25 percent from 2005-2011. In order to achieve these results, President Morales nationalized the hydrocarbons sector by decree early during his first year in office, allowing his government to engage in effective redistribution and macroeconomic policies that benefited the poorest segments of society. For decades, natural resources extraction in Bolivia has alternated between public and private control. The oil and gas industries in Bolivia were privatized in 1996 through Hydrocarbons Law No. 1689 in a process heavily supported by the International Monetary Fund (IMF) and the World Bank as part of a neoliberal reform plan to increase foreign investment in those industries. YPFB (Bolivia’s state hydrocarbons company) was divided into three companies and 50 percent of the shares were auctioned to the private sector, a process that turned control of YPFB’s major assets over to private companies. The winners of the auction, including Enron, Shell and Repsol YPF, were not asked to pay for their shares; instead they simply committed themselves to investing an amount at least equal to the sale “price” over a period of seven years, the epitome of neoliberal governments giving away state assets.1 Additional efforts to attract foreign capital included lowering royalties and taxation rates on the gas industry from 50 percent to 18 percent. International companies were allowed to take possession of any hydrocarbons they extracted, except for a small amount slated for domestic consumption in Bolivia. Foreign investment and production increased, and new natural gas deposits were found, but the public sector’s chronic fiscal deficit worsened. 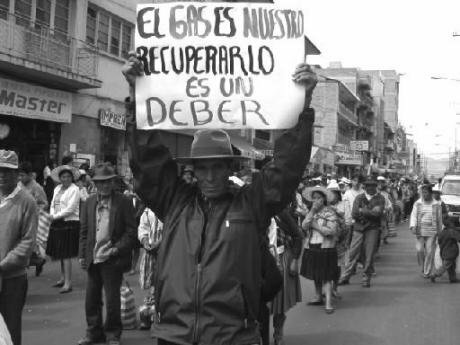 Rather than attempt to raise taxes on the immensely profitable hydrocarbons industry, now dominated by foreign corporations, the government announced it would create an income tax (the so-called “impuestazo” of 2003) despite prevailing low wages, high unemployment, and high levels of poverty. At around the same time, the government announced plans aimed at raising revenues by expanding gas exports with a pipeline through Chile, which would enable sales to the U.S. and Mexico. In response, President Mesa reluctantly passed Hydrocarbon Law 3058, which increased taxes and royalties paid on gas extraction from 18 percent to 50 percent. Not only was this seen as too conciliatory to foreign companies, a lack of political will led to the law not being fully implemented. Protests grew throughout the country, and Mesa resigned in 2005. In May of 2006, five months into his presidency, Evo Morales nationalized the hydrocarbons sector, re-founding the state company YPFB through a repurchase of majority shares in the privatized enterprises and claiming public ownership over the country’s gas and oil resources.3 Foreign companies now turned over extracted resources to the state, which fully controlled sales, transportation and distribution as well as key decisions regarding the refining of raw materials. The nationalization decree also forced foreign oil companies to renegotiate contracts with the new administration. This has resulted in increased revenues to the central government that in 2011 were worth 16 percent of total hydrocarbon revenues (in addition to the 50 percent achieved under Hydrocarbon Law 3058). The added income has additional significance because the 2005 Hydrocarbon Law, largely preserved by Morales, created a system in which much of the public sector revenues bypass the central government and are distributed unequally and regressively among Bolivia’s nine departments. Gas nationalization had a number of interrelated benefits for Bolivia. By claiming a larger role in the industry, the state was able to increase its ability to capture rents associated with hydrocarbon extraction. For each year between 1970 and 2005 the balance of Bolivia’s non-financial public sector was in deficit, but in 2006 the government achieved a surplus of 4.5 percent of GDP and it has remained in surplus every year since, a change that can be attributed to higher revenues. Since 2005, revenues to the government from the hydrocarbon sector have increased almost seven fold (in nominal U.S. dollars). Of course, the government budget has also been helped by higher tax collection, which is linked to the faster GDP growth. Nationalization of the gas industry allowed the state a bigger role in determining the industry’s broader impact in Bolivia. The government renegotiated supply contracts with Brazil and Argentina, significantly raising the export price of gas and thus bringing them closer to a fair market value. With nationalization, local content commitments were suddenly a part of negotiations for gas industry contractors, consultation periods with local communities could be better enforced, and technological transfer agreements could be arranged to increase the benefits accrued to Bolivians. For example, in 2013, Morales inaugurated the country’s first natural gas liquids separation plant, as part of a program to increase the value-added of the gas industry in Bolivia, and thus the rents accrued from exploiting the country’s natural gas. Higher revenues allowed the government to increase spending on social programs. Over 11 percent of the government’s revenues from the hydrocarbon sector are earmarked for universities, indigenous groups and the Renta Dignidad grant, a monthly payment to low-income residents over the age of 60 which has provided support for more than one million people. Overall, public spending on health, education, pensions and poverty alleviation programs rose 45 percent in real terms from 2005-2012. Although this increase did not keep pace with the fast growing economy, it helped lower poverty from 60.6 percent of the population to 43.4 percent over the same period (2005-2012), thus lifting about one million people out of poverty (from an initial population of 9.4 million). In addition to spending on social programs and infrastructure, some of the resource earnings were directed to Bolivia’s Central Bank where they helped grow the country’s stock of international reserves. International reserves, mostly U.S. dollars, act as a buffer against external shocks, preventing balance of payments crises by ensuring an adequate supply of U.S. dollars for importers to exchange for local currency. In 2005, Bolivia’s international reserves could cover 6.9 months of imports, while in 2013 the country’s international reserves could cover 15.9 months. Bolivia’s more than adequate level of international reserves is one of the main factors that has allowed the country to avoid resorting to loans from the IMF. For the 20 years preceding the Morales administration, Bolivia was operating continuously under successive agreements with the IMF (with the exception of one 8-month period). Agreements with the IMF were a de facto condition for funding from other sources, especially the World Bank, Inter-American Development Bank and high-income governments. Neoliberal policies were imposed on Bolivia by this creditors’ cartel, who among themselves “collaborated extensively on fiscal and financial sector reforms as well as other structural reforms [for Bolivia],” though the World Bank “took the lead in advising the authorities on capitalization (privatization),” including the gas privatization of 1996. Nationalization of Bolivia’s hydrocarbons sector in 2006 went against the recommendations of these international development institutions and the Washington Consensus. In 2006 the World Bank even wrote that with nationalization, revenues to the government “could diminish due to a fall in [natural gas] production.” The actual result was very different, as predicted by many who supported the re-nationalization decision. Bolivia’s success in recent years signals a second independence for the country, now able to pursue economic and social policies without the influence of the United States, which wields considerable power within international financial institutions like the IMF and World Bank. In Bolivia, impressive poverty alleviation and faster economic growth were achieved through an economic program that prioritized increased sovereignty over natural resources. 1 Kaup, Brent Z. 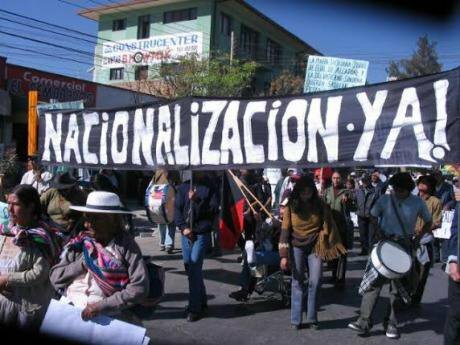 “A Neoliberal Nationalization.” Latin American Perspectives 37.172 (2010): 123-138. 2 Velasquez-Donaldson, Christian. “Analysis of the Hydrocarbon Sector in Bolivia: How are Gas and Oil Revenues Distributed?” World Resources Institute (2007), 7. This article is a part of the OurKingdom series Modernise: de-privatise, examining what the UK can learn from other countries around the world who have been successful in democratising their economies.